Our warm months seem to be passing by so quickly! Between the day job, taking care of normal life duties, now the garden, and the baby chicks, I have been seriously lacking in my blogging!! Please know that life is good! We are just busy busy, and enjoying some time outside! Our chicken coop is still a work in progress, but the chicks are loving it! They are growing so fast, they keep pushing us to the next step faster than we thought we would have to be there! Like the day I knew they needed to feel that green grass under their feet! Truckin' Man roughed in a door opening for them, so that they can get some sunshine, bugs, and fresh green grass! Some just liked to look without actually taking that step outside! So much fun watching them. This picture is already a couple weeks old, and they have lost most of their fuzz, and have feathers growing in. Very few have names so far, but this lady does. This is Georgette! This is one of the two Buff Cochin Bantams we have. We did have three Silver Laced Wyandottes. Two of them were for my parents, and they took them home to their coop yesterday. The chicks quickly out grew the little chicken run, and the low fence. So today, we had to put in the permanent fencing. That began with needing a gate. I found an old tailgate to a wagon that was made out of 2 x 4's. I thought that was a perfect start! 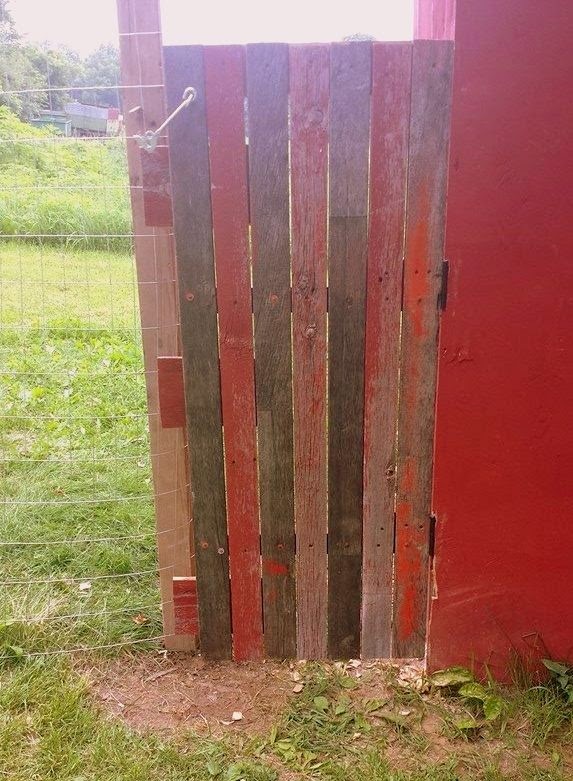 After looking at it, Truckin' Man agreed and cut up a couple old barn boards to fill in the gaps. Isn't it perfect?! I just LOVE it! Do you have any baby chicks this year? I'd love to hear about them! What cute chicks! My youngest son and DIL, who live in Dallas, have a chicken coop and three chickens. They're hoping to get eggs in the Fall and they'll be sharing them with me. It's really popular for people to have chickens in the city. My son just lets them run around the yard. It's been fun seeing them grow. I absolutely love to see the photos of the chickens, they are beautiful! I just love their variations of color and they just look so… Happy :-). I agree with you though, the warm weather months seem to be flying by… I just wish we could press a "stop button". Let's enjoy it while we can!